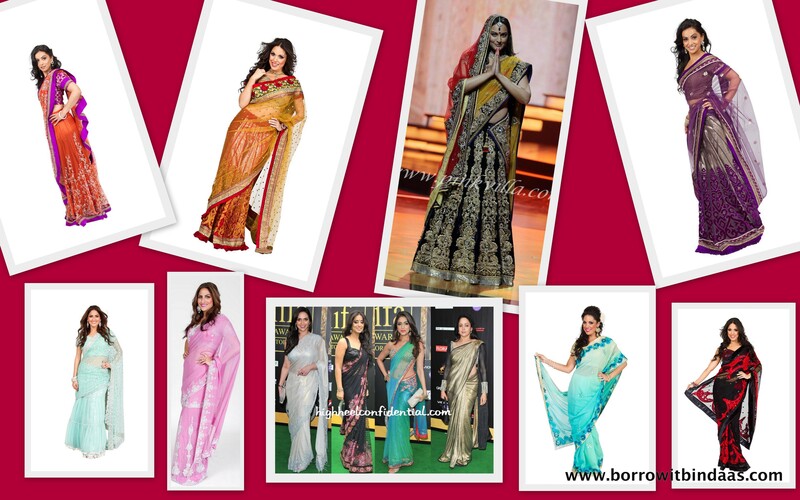 From Manish Malhotra to Sabyasachi, IIFA 2011 was glowing with bollywood celebrities in beautiful designer sarees. With Priyanka Chopra and Malika Sherawat all in light colors, it appeared that beige was major trend on this years green carpet. Mixed in with the light hues were some bright pops of color as Aarti Chabria in turquoise blue, Mahi Gill in black walked the carpet wearing Neeta Lulla and lastly Sonakshi Sinha donning a jewel-toned saree from Vikram Phadnis. Whether they were wearing color or not, one thing was certain, the sarees were all net and or sheer and we think that trend is here to stay. At Borrow It Bindaas, we are proud to offer you the latest in Indian fashion so that at your next party, you too can shine like Bollywood star! « Winners of Our Exclusive Triple Giveaway announced! !